PRESS RELEASE: The Guitar Play-Along Series will help you play your favourite songs quickly and easily. Just follow the tab, listen to the tracks to hear how the guitar should sound, and then play along using the separate backing tracks. The melody and lyrics are also included in the book in case you want to sing, or to simply help you follow along. This special edition book includes an SD memory card perfect for Fender G-DEC 3 users. All of the included play-along recordings can be accessed by simply inserting the card into the amp's card slot. In addition, custom G-DEC 3 tone presets are included go guitarists can easily enjoy playing the right guitar tones and effects for each song. Students and teachers who use G-DEC 3 amplifiers will find their lesson experience greatly enhanced by these convenient tools. Compatible with Fender G-DEC 3 Thirty and G-DEC 3 Fifteen amplifiers, or card reader on computer. G-DEC 3 tone presets are included so guitarists can create the right tones and effects for each song in the book. SD card has additional storage capability allowing guitarists to save additional presets, backing tracks, phrase samples, or lessons. 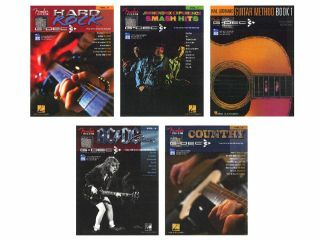 Nirvana, Stevie Ray Vaughan, Jimi Hendrix (Smash Hits), Country, Acoustic, Hard Rock, The Doors, ZZ Top, AC/DC Classics, Hal Leonard Guitar Method - Book 1, Eric Clapton, Tom Petty.